Seamer Ben Coad hailed his best ever bowling performance as Yorkshire began their County Championship Roses clash with Lancashire with a demolition job. Coad posted a career best 6-25 from 11.4 overs as Yorkshire skittled their bitter rivals for 123 shortly after tea on the opening day. As expected, conditions favoured seam bowling, and Coad and Ryan Sidebottom, who claimed 3-30 from 14, took advantage in some style as Lancashire opted to bat first at Headingley. He said: “It was a bit of a surprise this morning when they chose to have a bat. It was very helpful for the seamers, swinging and seaming. “It’s just been a good day. We couldn’t have asked for anything more. 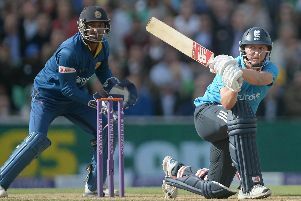 “We got the wickets we needed and have started really well with the bat. “That’s my best bowling performance so far. “The pitch benefited me massively and the overcast conditions helped. At one stage, Coad had figures of 4-5 from 3.1 overs, and his 32 first-class wickets for the season is more than anyone else in the country. He has 29 in the Championship, which leaves him one behind Kent’s Darren Stevens. This was his second six-wicket haul. Yorkshire were left with 34 overs to bat before close, and they reached 93-2 from 25.4 following more rain late on. Sidebottom, 39, and 23-year-old Coad were both on hat-tricks as an understrength Red Rose side struggled to cope with an on song attack. They are missing injured seamers Jimmy Anderson and Kyle Jarvis - both are here undertaking fitness work - and batsman Liam Livingstone due to Lions duty. South African overseas all-rounder Ryan McLaren and Stephen Parry top-scored with 30 apiece after play started at 1.10pm. Steven Croft was the only other man to make it to double figures. Given their insistence that there would be more in the Headingley pitch than there was for the draw Emirates Old Trafford last month, Yorkshire would no doubt have been happy to bowl, especially with the added bonus of overcast skies all day. Sidebottom made the initial breakthrough in the seventh over when, with successive deliveries, he had Alex Davies caught in the gully and Luke Procter caught behind as he left alone to leave the score at 18 for two. Coad then had Haseeb Hameed caught behind with his second ball in the 15th over. He then had Croft lbw and Shivnarine Chanderpaul caught at fourth slip at either end of the 19th before Dane Vilas fell caught behind down leg with the first ball of the 21st, leaving the visitors six down. McLaren went beyond 2,000 Championship career runs, but he too departed in an action packed afternoon. He followed Jordan Clark back to the pavilion, with both falling lbw to Jack Brooks and Sidebottom as the score slipped to 89 for eight in the 31st. After tea, with Coad now bowling from the Kirkstall Lane End, he had Tom Bailey caught at gully and Parry caught at second slip by Adam Lyth, who then got off to a positive start with the bat on the way to a season’s best 40 not out. Lyth hit two of the first three balls in the innings for four off Bailey, and Yorkshire reached 50 in the 12th over one wicket down. That wicket was Alex Lees caught in the gully off Bailey as the score fell to 21 for one in the fifth over. Lyth shared 64 for the second wicket with Peter Handscomb, who fell for 33 before close when he edged Procter behind.